August | 2010 | Brown. Girl. Farming. I have been learning way more than I expected out here in West Virginia. I knew I would learn a lot about growing food, but thanks to my “wise teacher”, Rebekah, I have learned so much more. Claymont, the spot I have spent the last six weeks working and living, is not just a farm. It is an intentional community where people have come together from all walks of life to live…well, intentionally. And no, it is not a cult. The property has its own spring as a water source, the work to maintain the 350 acres is all done in exchange for housing by the community members and they grow and make much of their own food. The people are wonderful and skilled at many things, and one of those people made my entire experience here more amazing then I could have hoped for. What has my experience here been like? Well, we start our days at 8:30 a.m. sitting in meditation and then checking in with everyone. Then we go off and work in the garden, the orchard, the greenhouse, the kitchen or maintaining the grounds/buildings a bit. During all that, I’ve learned everything from plant identification, to making compost tea for the soil, to building garden trellises, digging new beds, and learning the complexities of certain crops and how to deal with diseases, pests and heat to keep them from dying. But I have also had the chance to learn a lot in the kitchen: preserving foods through canning, making bread and pasta from scratch, pressing cider from apples by hand, dehydrating fruits and cooking all sorts of meals with the food harvested here. I’ve learned about running a CSA, living as part of a community and even learned about astrology, medicinal uses of plants and herbs, and so many cool things from the amazing Rebekah. When Harvest Day came this past weekend and friends from D.C. came out to join in apple picking, pressing apple cider, pasta making and a big feast, I was really excited to show them around and share some of the knowledge I have soaked up here. It was a perfect day and we all had a lot of fun being on the farm and working together. But the proud moment for me came when it was time to give everyone a tour. I put my geek face on and pranced around the gardens pointing out all the plants, spouting facts about each of them and answering everyone’s questions. All the while Rebekah quietly peeked in on the tour, and I couldn’t help but notice her quiet, proud smile as she realized how much I had soaked up from her over the past six weeks, and how happy I was to be able to spread that knowledge. That moment for me, was a perfect closure on my experience in West Virginia, but it also reminded me that certain people come into your life to teach you something special and you should always take the time to soak in as much as you can. I don’t like to put negative, ranting posts up. However, sometimes it’s best to let things out into the world in order to detach from them. So I will get this out once and for all before these negative, mean thoughts snowball in my head and I end up accidentally running the tiller blades over someone’s foot. (Jokes, I don’t believe in violence). I would just like to declare, for those under confusion, that the F in WWOOF stands for Farms. 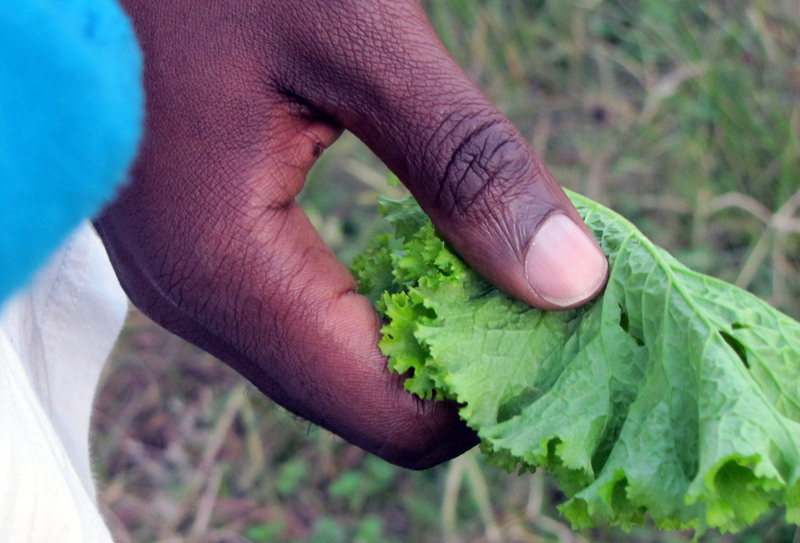 Willing Workers on Organic Farms or World Wide Opportunities on Organic Farms. Sunshine. The sun creates heat; which produces sweat, which intensifies the longer you stay in the sun. In other words, working on a farm will be hot and sweaty. The sun is kind enough to have this effect on every human being, so please don’t act like you are the only one that the sun is shining down on. Bugs. They live outside; everywhere. They will be all around you and will crawl on you as long as you are outside working in their territory: the dirt. If youcannot handle bugs, I suggest not signing up to farm. Dirt. It is the foundation of the outside world. It is the foundation of farming. It is impossible to avoid getting dirty, muddy, and dusty while farming. DO NOT wear your favorite cute outfit while farming–or even bring them to the farm. Nature.. and nothin’ else. On a farm it is just you vs. nature; you vs. those big logs in your way; you vs. those roots that need to be dug up; you vs. all the work that has to be done. There are no magic tools or people (slavery was abolished ages ago) that will do all the work for you. Therefore you will have to use your whole body –all your muscles– to do all the work. That’s why it’s called manual labor. It will be hard. You will get hurt. Get over it. That’s it. Thanks for playing. The President in Washington sends word that he wishes to buy our land. But how can you buy or sell the sky? The land? The idea is strange to us….Every part of the earth is sacred to our people… If we sell you our land, you must remember that it is sacred. Will you teach your children what we have taught our children?… What will happen when the buffalo are all slaughtered? The wild horses tamed?… Will there be any of the spirit of my people left? This we know: the earth does not belong to man, man belongs to the earth. Man did not weave the web of life, he is merely a strand in it…So, if we sell you our land, love it as we have loved it. Care for it, as we have cared for it. There I was, crying like a baby, in complete silence. I sat quiet, tears streaming down my face, and cried hard and deep. I was crying for all the ways humanity has fucked up over the years; but mostly, I was crying for breaking the trust of people that truly believed there was no way we could ruin the land they considered their blood. I had just finished listening to the above passage read aloud, while sitting cross-legged in a Buddhist monastery in Thailand. I was there for ten days to meditate in complete silence, otherwise known as a Vipassana retreat. It wasn’t my first history lesson; but for some reason this speech struck a chord in me. Sitting there crying to myself, I had a moment of pure clarity and direction. I knew at that point that I would join the movement of people dedicated to making up for all the fucked up things we have done as a society over the centuries; particularly to give back to the land that we have betrayed. I know, I know. Now, cue the sucking of the teeth and the mumbling of “tree-hugging hippie” under your breath. But, I don’t mind. I just hope everyone has found something that moves them as much as this message moves me. And I hope you have something that you can feel as deeply about; no matter what it is. 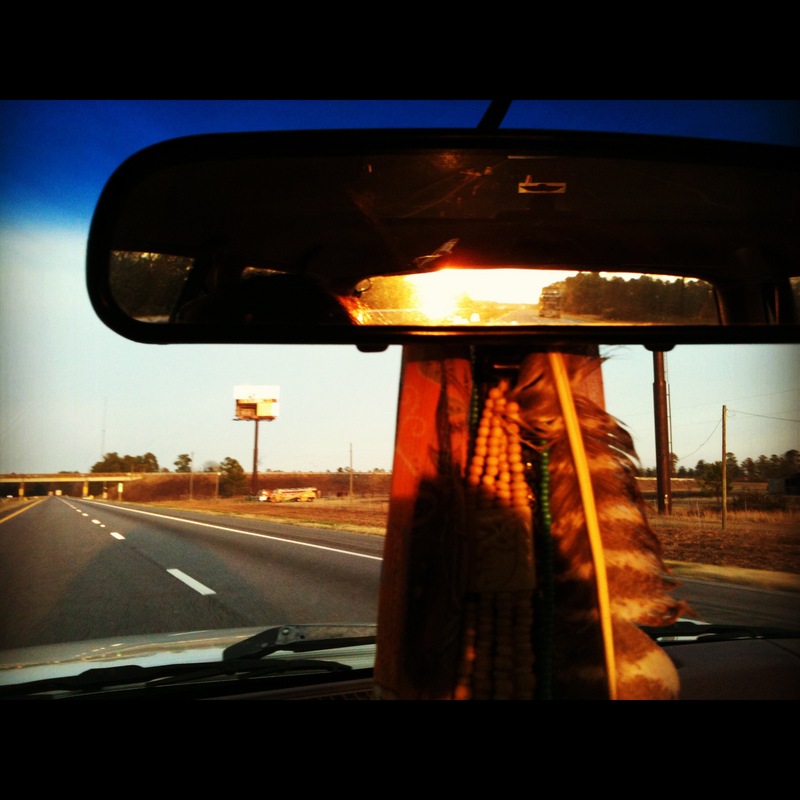 Today, I was reminded of that experience I had almost three years ago. (Not that I haven’t thought about it a dozen times since). I was out working in the new plot I cleared this week, digging out old corn roots to make way for new fall crops and flowers. It was raining and I was enjoying my bare feet soaking into the mud with all the worms (yes, hippies love the mud…and worms). Then I heard the drumming and chanting from the Lakota people that are using part of the farm’s land to conduct their 8-day Sundance ceremony here in West Virginia. It was a really cool feeling to hear this distant drumming and chanting while standing there so connected to the mud under my feet, doing the work of giving back to the land. It made me think of the people that used to take care of this land, having similar ceremonies so many years ago to pay tribute to the environment they survived on. I thought of sitting there in that monastery, crying in silence; and I know it is what has guided me to this point. So I smiled, and kept on digging, in the rain. The Claymont Community opens up their land to several groups of people throughout the year that need space to practice or teach their spiritual, sustainable living or nutrition and health practices. 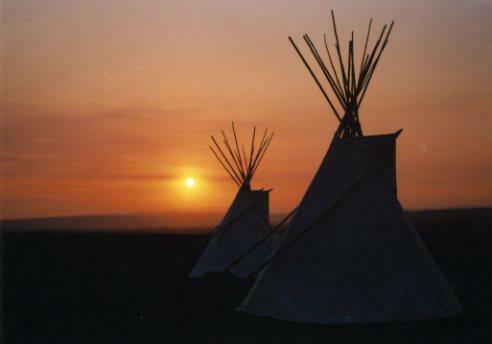 The Lakota people are from the Dakotas and still practice their ceremonies throughout the country to this day. I’m stuck on this concept of blending contrasts. Maybe it has to do with being the only brown girl I know interested in farming (although this really shouldn’t be a contrast at all); or maybe it has to do with going from political activist to farmergirl overnight — and wanting to blend the two. It could also be the happy feeling I get when pulling weeds in a quaint, quiet garden while listening to the intense sounds of Immortal Technique. Or this could all just be too deep, and these thoughts were only sparked from the meal I just had while sitting in a barn in West Virginia: Mexican food and French wine… out of a mason jar. Either way, blending things that aren’t expected to go together is my thing; always has been. Makes sense right? After all, I’m a girl born of blended love: young white girl from Texas meets aspiring Black Panther from the dirty South. Their eyes meet in a club in L.A. The rest is history, out pops me. I was always blending contrasts throughout my childhood, without knowing it; I was just being myself: a tomboy that hated skirts and wanted to catch lizards and climb trees yet constantly dreamt about the boy she would fall madly in love with one day; then a cute high school girl that you’d expect to be breaking hearts in a miniskirt, but would walk around campus in an over sized Elmo t-shirt and baggy jeans instead. I was the smart girl that never studied; the shy girl that loved performing theatre; the only girl of color for miles that listened to country music–and loved it. And nothing’s changed. Now I’m the advertising grad that despises consumerism; the advocate that hates public speaking; and the girl that wants to farm…in the middle of the city. I want to grow vegetables pesticide/toxin free right in the smog of L.A. 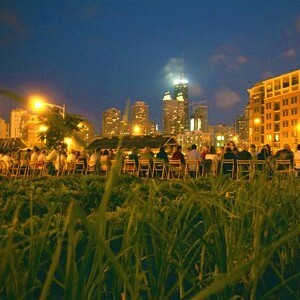 I want to stand barefoot spreading hay under the skyline of Chicago. I want to feed pigs with the leftovers from Chinatown dumpsters in Manhattan. I want to watch a 19 -year-old gang member help his 70-year-old neighbor harvest tomatoes from a garden growing in the cracks of Oakland streets. I’m on a mission to continue blending contrasts in the hopes of making something beautiful. So my farm hopping may take me from the country to the city, from culture to culture and from sea to shining sea, but I will stay focused… and just keep doin’ me. Add farm. Add yours truly. Press blend. Today was a cool day on the farm; and I’m not by any means talking about the frickin’ weather, ’cause it’s hot as balls. I mean today was a very cool day because of what’s been going on–and the day is only half way over. Eight baby chicks were hatched today; but the coolest part was that they were unplanned. Yes, an unexpected chicken pregnancy. There are two kinds of chickens. Roosters (male) and Hens (female); the roosters crow and puff their chests out all day, while the hens work away in the coop laying eggs — one per day to be exact. Then we (the farmers) come along and take the eggs before they can develop into babies, and we stunt the baby growth by putting the eggs in the fridge…then we eat them in a delicious egg and cheese sandwich. Why do the hens let us steal their babies everyday? Well, they’ve simply adapted to being domesticated and used for food cultivation over the years. But sometimes, their procreative instincts kick into gear and they will peck your goddamn hand off before they let you steal their baby. 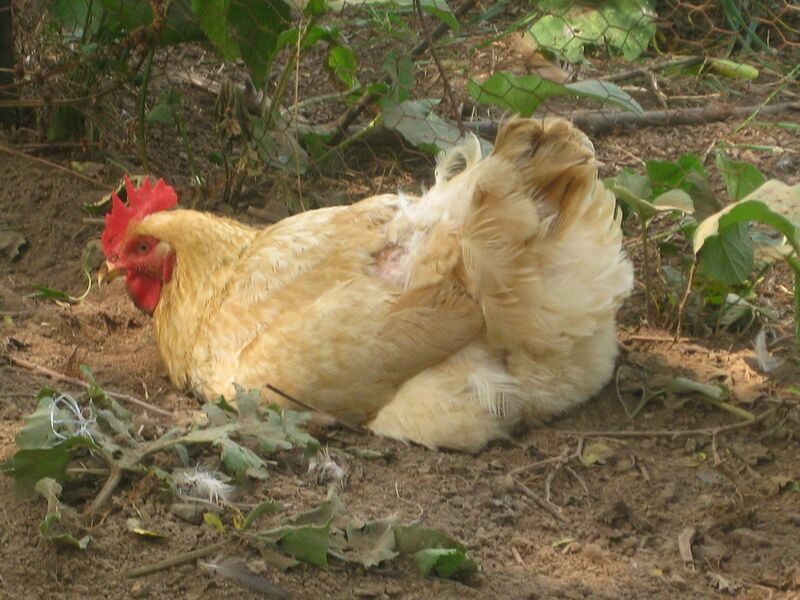 When a hen does this, it’s called being “broody”. 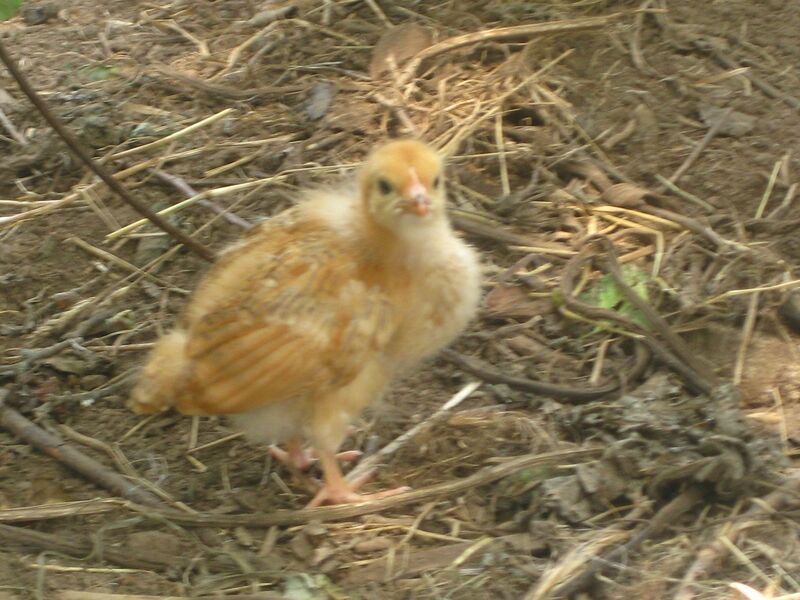 A broody hen will escape the chicken coop and go off on her own to sit on all her eggs as she lays one each day. She will sit and sit and sit, using the warmth from her body to warm them as they grow… and then they hatch! And half fury, half slimy little baby chickens pop out of that soft white or brown little shell that we’re all so used to cracking over a hot pan to make breakfast. This my friends, is exactly what occurred here today on the farm. Minnie, the smallest hen of the pack, became broody and escaped the coop in determination to have the babies that were rightfully hers. And have no doubt that all the other chickens were talking about it. They were clucking away like gossiping old women all afternoon. It was easy to imagine what they were saying; it doesn’t take long to figure out how to speak chicken. Now we have eight new little baby chicks, chirping away in their new home..the tool shed. Pretty frickin’ cool if you ask me. 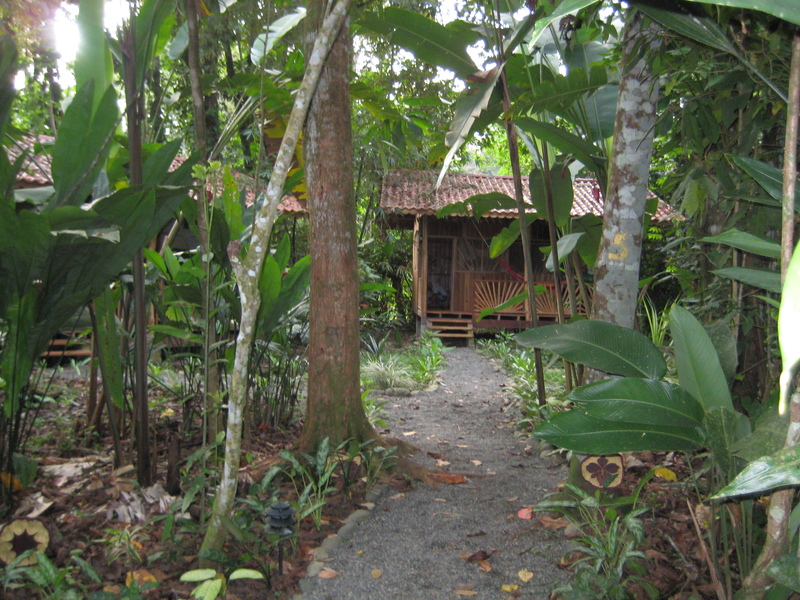 Costa Rica – Puerto Viejo!